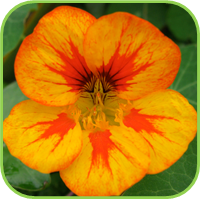 Bright orange, edible flowers and cream and green variegated leaves. The leaves and flowers have a peppery taste. Add to salads and vegetable dishes. The flowers make a wonderful garnish. Medicinal. Annual. H:35cm W:30cm. 12cm, 17cm. • Trailing Annual, Frost Sensitive. •±60cm; Spread: As far as allowed to creep or trail up. 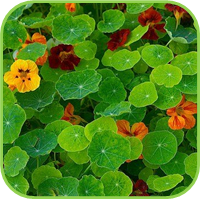 •Red, Orange and Yellow flowers with variegated leaves. •Intense Red flowers with dark grey foliage. • Pick the seed pods just before they loose their green colour (for pickling in vinegar). 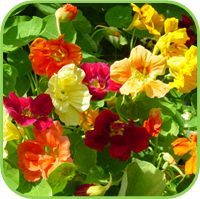 • Host Plant for: Aphids, Attracts BLACKFLY to itself and away from vegetables. • Salads, Sandwiches, Garnish, Vinegars. • Use chopped leaves with Cottage cheese and other Spreads. • Buds and Seeds are used as a substitute for capers. • Ripe seeds are roasted and ground as a seasoning. • Add to bathwater for its antisepic and healing properties. • Alopecia - fresh juice rubbed into the sculp is said to stimulate hair growth. • Topical: Wounds, Skin eruptions. • Antiseptic, Antibacterial and antifungal activity. • Hay fever due to histamine content. • 2-3 bruised leaves in a cup of boiling water. Infuse 15 minutes. One cup three times per day. • 1-3 teaspoons in half a glass of water, three times a day.